Our third day in the snow-covered Norwegian capital, Oslo. It’s december 11th, the day Alfred Nobel died – and laureate Jimmy Carter will be awarded his Nobel Peace Prize in The Oslo City Hall. However there a total of four big events on our schedule today..
Dispuite temperatures below the freezing point, 2000 children this morning were gathered at the Rådhusplassen, outside the City Hall. They were there first of all to greet Jimmy Carter in a peace celebration. 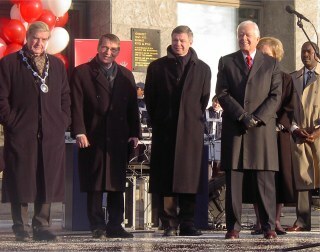 Norway’s Prime Minister Kjell Magne Bondevik was also among the celebrities, along with the Major of Oslo and former Nobel Committee members. Both Carter and Bondevik held speaches at the arrangement, which was made possible by the organization “Save The Children”. Carter was greeted by 2000 children. The Peace Prize Ceremony at The City Hall was of course the biggest highlight of the day. Two of our students were accredited to the event, where former US President Carter received The Nobel Peace Prize in front of royalties, dignitaries, family and millions of TV viewers. He accepted the award at the beautiful ceremony with flowers and music. 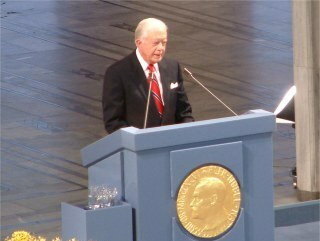 Jimmy Carter is the third US president to receive the Peace Prize, after Woodrow Wilson and Theodore Roosevelt. Carter, 78, was praised by Gunnar Berge, the head of The Norwegian Nobel Commmittee, as “one of the most well-desrving and least controversial winners in recent times”. Carter was honored for his pursuit of peace, health and human rights that began with the 1978 Camp David accords between Israel and Egypt. Smiling broadly, Carter displayed the Gold Nobel medal and diploma to sustained applause and standing ovation. The prize also included, approximatly $1,2 million in cash, he will use for peace work at his Carter Centre in Atlanta. However the day was far from over for the laureate..
Later in the afternoon Carter’s program continued. Just a couple of hours after The Peace Prize Award Ceremony, he was back in The Oslo City Hall, due to participate in CNN’s live broadcast. In an interview with Jonathan Mann, Jimmy Carter discussed his lifetime of humanitarian work both during his US Presidential term and beyond – including the impact of The Carter Centre around the globe. Two of our reporters were accredited to the event..
Later in the evening severeal hundred people participated in the traditional torch-light parade in Carter’s honor. The march stopped outside of his hotel and in freezing cold waiting for Jimmy Carter and his wife to show up at the balcony. Finally they came out and waved to the crowds. After a few minutes the Carter’s stepped inside again to attend to the Nobel banquet, with peanute cake on the menu. For our reporter’s there were still work to do. Deadline for the latest articles in just two hours..